1. Remove canopy and reservoir lid. Plug in power plug to base. 2. For longest run time, fill diffuser with water to max fill line of 100ml. For stronger output use less water. 3. For fragrance, add 1 to 10 drops of essential oil to water. 4. Put reservoir lid and canopy back over the diffuser, making sure the lid is completely seated on seal. 5. Plug into 120VAC electrical outlet. Depress the left toggle button "on" position. Press the button again to turn off. Unit will shut off when out of water.The right button turns the light on and toggles through a colored light sequence and then off. 6. Timer Options: four lights on after press the power button. from left to right are 30minutes 60 minutes 120minutes and 180minutes. 7. To disconnect, press left switch turning off the sonic. Remove plug from outlet. Do not pull on cord to disconnect from outlet. 8. Clean water chamber between uses. Do not let water or moisture remain in the unit when not in use. Due to different measuring way, the size may exsits 1-3cm errors. 1.SOOTHING & RELAXING: Enjoy the spa everyday in the comfort of your home and let this diffuser transcend you into deep relaxation. 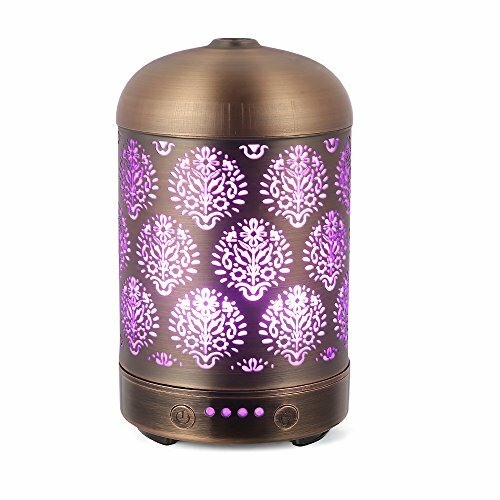 2.FEATURES: Gently lifts the scent of your favorite essential oils into the air to transform the mood of your space. Cool mist adds moisture to the air and gives any room a spa-like ambience. Can be used as an aromatherapy diffuser/humidifier/air purifier/night light. 3.AUTO-OFF: The auto shut-off function gives you peace of mind when using the diffuser, as when it is detected that there is no more water, the diffuser will automatically power off. 4.TIME OPTIONS: Four lights on after press the power button. from left to right are 30minutes 60 minutes 120minutes and 180minutes. Portable for Home, Yoga, Office, Spa, Bedroom, Baby Room. Perfect gift idea for family and friends who love aromatherapy or can benefit from Aromatherapy healing. 5.SUPER QUIET: The diffuser adopts ultrasonic technology and runs quietly. It would not be disruptive while you sleep. Kindly note: The ONLY issue of this Oil Diffuser is its 100ml capacity. WARRANTY: 45 days money back & 6-month worry-free guarantee. If you have any questions about this product by COOSA, contact us by completing and submitting the form below. If you are looking for a specif part number, please include it with your message.